The InteliHead transforms the conventional sprinkler head into an intelligent and fully customizable irrigation system that can be controlled through a dedicated, supplied tablet. The InteliValve™ utilizes smart valve technology to deliver a fully customizable pattern by controlling the flow of water at every degree around the 360 rotating InteliHead. When head is operational, the turf cup rises on top of the sprinkler allowing normal water flow. When head is down, the turf cup is virtually invisible and play will not be affected. InteliRain has developed a revolutionary irrigation system consisting of computer hardware, software, sprinkler heard, canister, variable orifice nozzles, flow control and weather station. These innovations come together to create our state of the art digital irrigation system. 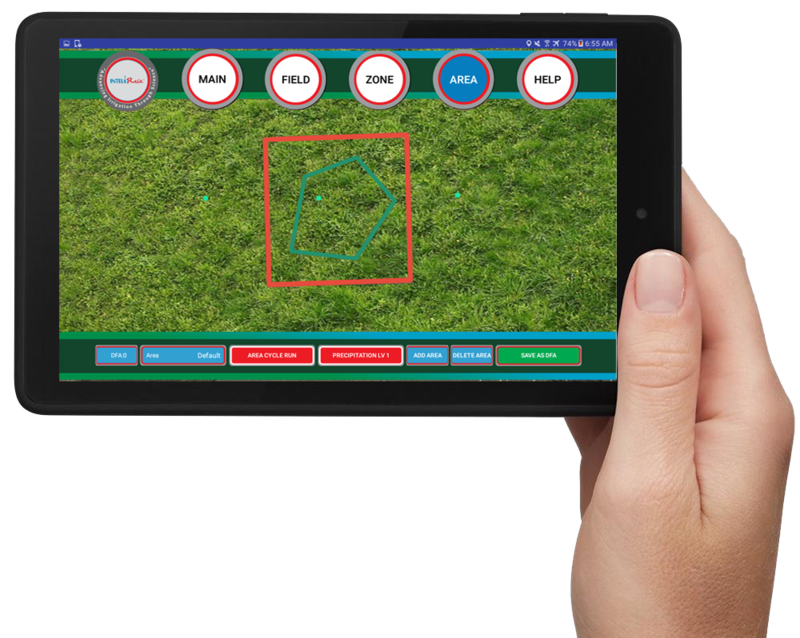 It is the first turf irrigation system to combine the latest advancements in science with cutting edge technology to create a fully robotic sprinkler system. InteliRain has been fortunate to have irrigated turf throughout many locations in North America. Our intelligent sprinkler systems are irrigating the turf for the cricket pitch Mattamy Homes in Calgary, Rocky View School Division grounds, the fairway and grounds of Mountain Vista Golf course in Southern California Palm Desert, four fields for Major League Soccer (MLS) Club, and two full sized baseball fields for the soldiers, airmen and families of the Canadian Armed Forces base in Edmonton. Our innovation is a smart technology that cannot be found in the market today, providing substantial water savings, simplified installation, unparalleled operational flexibility, reduced system maintenance and increased turf health. 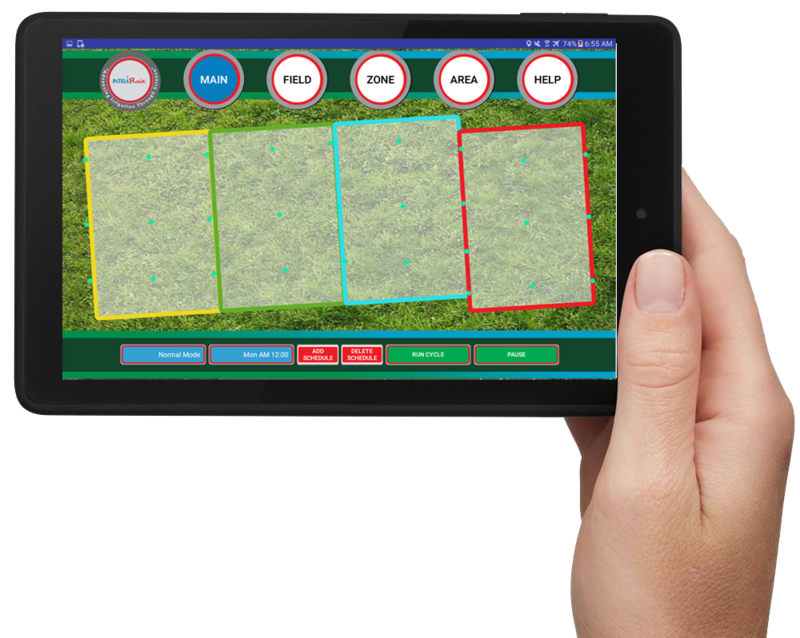 InteliControl provides complete system control including water scheduling, algorithm optimization, data processing and control of robotic components - all on a dedicated, supplied tablet. The system allows the technology to be smart, efficient and make dynamic decisions. India is severely affected by the decade long draught. Many crops and farming outputs have dwindled rapidly. It has forced thousands of farmers to commit suicide every year. To tackle this issue, InteliRain in collaboration with the University of Alberta have designed a modern irrigation cart with an InteliRain high efficiency sprinkler system. This project has the potential to reduce water usage for farmers in India by up to 50%. In India, there is a severe need to bring significant transformation to farming techniques especially in water saving techniques. .